Top sights such as the Anne Frank House, Sagrada Familia, and The Last Supper require advance online reservations while timeslots are sensible for the Louvre, Eiffel Tower, Vatican Museum, Alhambra and the Reichstag. Queuing for tickets is a thing of the past at several of Europe’s top tourist sights. At some, including the Anne Frank Huis and Van Gogh Museum in Amsterdam, The Last Supper in Milan, the Reichstag in Berlin, and the Sagrada Familia in Barcelona tickets are no longer sold on site and advance online reservations are essential. At many other popular sights, time-slot and skip-the-line tickets are the only sensible way to visit during busy periods but even in the off-season advance tickets are worth getting for the certainty of not having to queue for hours. Popular sights with advance purchase tickets include amongst others the Louvre Museum and Eiffel Tower in Paris, the Vatican Museum and Colosseum in Rome, the archaeological excavation sites of Pompeii and Herculaneum near Naples, the Uffizi Gallery in Florence, the Alhambra and Nasrid Palace complex in Granada, and the Pergamon Museum in Berlin. Some sights still add a small advance reservation fee to ticket prices even though advance reservations are now the only way to acquire a ticket! Visitors with free admission must usually also book a timeslot in advance – and pay the reservation free if applicable. Paying for advance time-slot ticket reservations to top sights is money well spent. Even with time-slot reservations the old adage of visiting early in the morning or late afternoon remain the best advice when visiting popular attractions in Europe. Guided tours are also an option to enter popular sights without delays. Tickets for the Anne Frank House and the Van Gogh Museum in Amsterdam are only sold online and cannot be bought at the museum in person. All tickets for these two popular tourist sights in Amsterdam now have specific time-slot admission reservations and long queues outside are no longer the norm. Currently, 80% of tickets for the Anne Frank House go on sale two months in advance. The remaining 20% of tickets are sold on the day of visit but once again only online. Bearers of the Dutch Museum Card (Museumkaart) and any visitor with free admission must also make online timeslot reservations to enter the Anne Frank Huis and the Van Gogh Museum. Tickets for the Rijksmuseum and Keukenhof may still be bought onsite but buying in advance is a much better idea. Time-slot reservation tickets are not available for these two sites – although it will be introduced for the All Rembrandts in the Rijksmuseum in 2019 – but visitors with tickets may go straight to the exhibitions. See also Online Skip-the-Line Ticket Reservations for Top Sights in Amsterdam for more information. Italy is blessed with seemingly endless historical, cultural and art sights but the queues for getting into the most famous sites can be unbearably long. For some, such as Leonardo da Vinci’s The Last Supper in Milan advance reservations are essential, but it is sensible to buy skip-the-line and time-slot tickets for all other popular sights if available. Leonardo da Vinci’s The Last Supper may only be seen on advance reservation tickets. Groups get a maximum of 15 minutes with the painting. Tickets are released in two-month batches and sell our very fast. In what seems to be a bit of a legal racket, guided tours are often available when regular time-slot tickets have sold out. Although the Vatican Museum (with Sistine Chapel) and the Colosseum in Rome may still be seen on regular tickets, advance purchase skip-the-line timeslot admission tickets are the only sensible way to see these popular sites even during the low season. The very small surcharge is absolutely worth it to avoid queuing in line for hours. Skip-the-line tickets are also highly advisable when visiting the archaeological excavations of Pompeii and Herculaneum near Naples. Similarly, getting into the Uffizi Gallery in Florence without a time-slot reservation may be very difficult on a busy day. See also Top Sights in Italy Requiring Reservations and Skip-the-Line Tickets to Top Sights in Rome and the Vatican for more tips and details. Skip-the-line time-slot tickets are increasingly necessary to see some of the top attractions in Spain. Admission to Gaudi’s Sagrada Familia in Barcelona is only on time-slot tickets. Although it is possible to line up at the Sagrada Familia to buy tickets, there is no guarantee that tickets will be available. During the high season, the church often sells out for days at end. Similarly, buy tickets for the Alhambra in Granada in advance, as the total number of visitors per day is strictly controlled. Admission to the magnificent Nasrid Palace complex inside the Alhambra is by time-slot ticket only. Two top sights in Paris for which advance purchase skip-the-line tickets are almost essential are the Eiffel Tower and Louvre Museum. Also buy time-slot tickets for the Palace of Versailles, if available. Tickets for the Eiffel Tower are best bought well in advance of a visit. Despite the high price, ascending the symbol of Paris remains a top priority to many tourists. If turning up without tickets, consider climbing the stairs – it is cheaper than the elevator ride and tickets are more readily available without advance reservations. 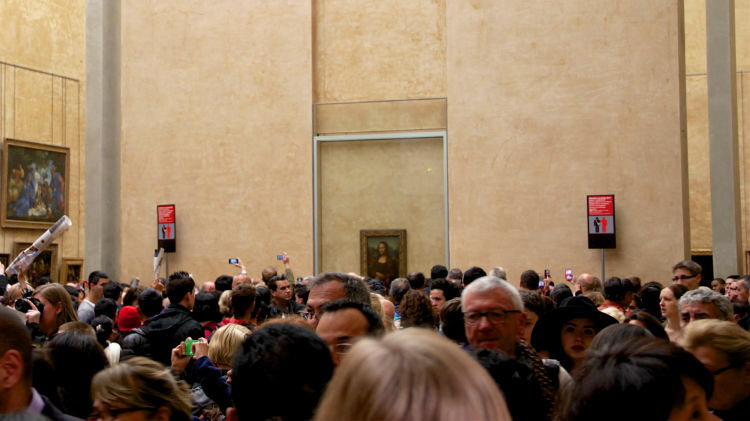 The Louvre recently introduced actual time-slot tickets in addition to regular advance purchase tickets. The small surcharge is absolutely worth the time saving. Admission to the security queues at the Louvre is currently in the following order: time-slot tickets, other tickets (including the Paris Museum Pass) and lastly visitors without or not requiring tickets. The security line queues at the Palace of Versailles are often very long and slow moving. Advance purchase tickets at least cut out the need to queue a second time for tickets. The Palace of Versailles also introduced time-slot tickets during the year end holidays 2018 / 2019 and hopefully this will become a permanent feature in future. Visitors taking a tour also use a faster group entrance. Inside the palace is often unpleasantly full – try visiting early in the morning or late afternoon. The gardens – free except on music and fountain days – are always pleasant and well able to distribute the crowds. See also: Paris – Buy Skip-the-Line Tickets for the Eiffel Tower, Louvre and Versailles. Three top sights in Berlin require time-slot admission reservations and these reservations are somewhat uncharacteristically free: the Reichstag dome, the Pergamon Museum and the Neues Museum. Admission to the German parliament – or more specifically the dome on top of the parliament plenary hall – is still free but advance online reservations are essential and close a few days prior to a planned visit. See Visiting the Reichstag Dome in Berlin for details. The only two major museums in Berlin for which time-slot reservations are possible and often required are the Pergamon and Neues Museum on Berlin’s Museum Island. These time-slot reservations are free and made at the Berlin State Museums’ website – also book free time-slot for bearers of the cheap Museum Pass Berlin, a Museum Island Ticket or children under 18. Make separate time-slot reservations if planning to see the Pergamonmuseum Das Panorama exhibition – it is not physically connected to the Pergamon museum itself.